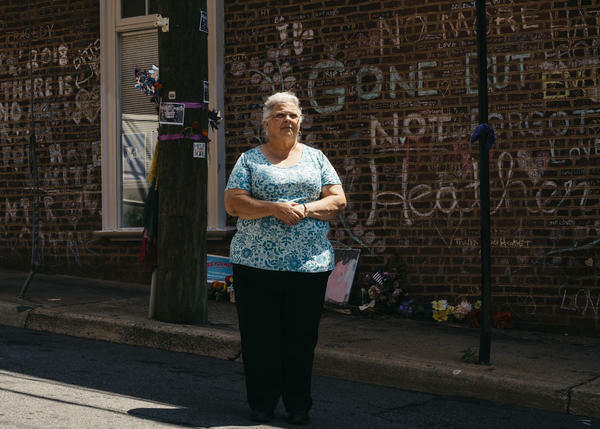 Susan Bro stands on 4th Street Southeast in Charlottesville, Va., where where her daughter, Heather Heyer, was killed. 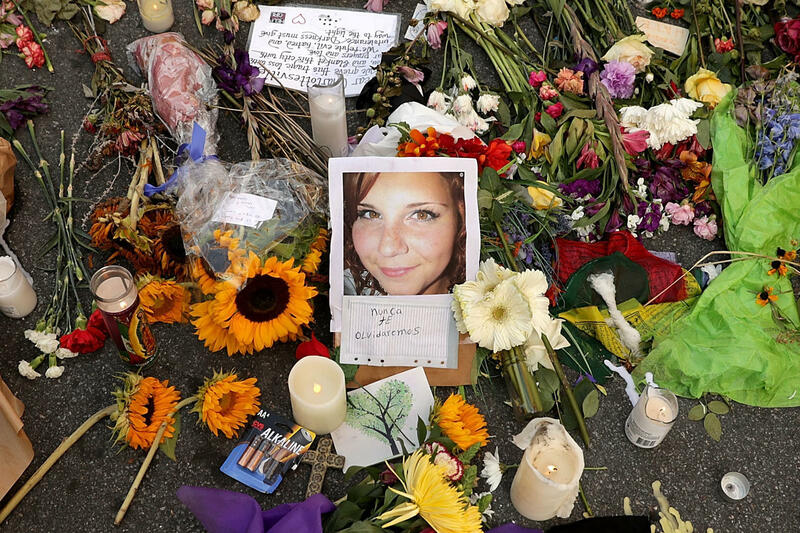 Heyer died in August 2017 during a violent white nationalist rally. Parts of a memorial for Heyer. Bro started a foundation after Heyer was killed during the rally. Flowers, candles and messages surround a photograph of Heyer a few days after her death in 2017. 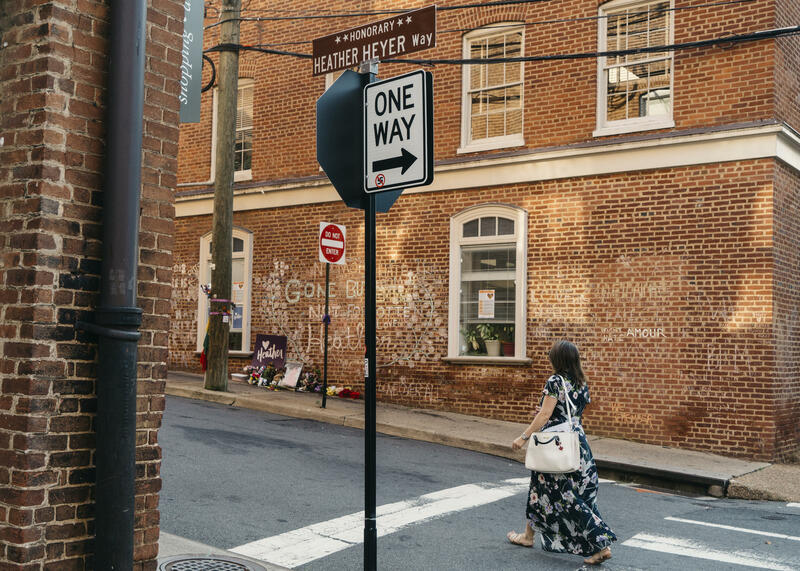 On the downtown block where Heyer was killed, a street has been renamed Heather Heyer Way. Bro now spends her days in a cozy office at the law firm where her daughter worked as a paralegal. It's the headquarters of the Heather Heyer Foundation. Near her desk is a sign with her daughter's favorite motto — "If you're not outraged, you're not paying attention." "I think that's what we have with Heather's legacy, is a call to action," says Bro. Heyer hadn't protested before Charlottesville but did speak out on race and gay rights, friend and co-worker Courtney Commander told NPR last year. Portraits of Heyer hang on the walls, and there's a collection of posthumous civil rights awards. Bro resists the notion that her daughter is some sort of symbol. She didn't make speeches, or lead rallies, Bro says, but tried to persuade those around her to care more about inequality and social justice issues. Bro has taken up her cause. "Not only will I speak and speak loudly and often," she says, "I'm going to make sure that other people speak." She compares it to a relay race. "They knocked the baton out of her hand. Well, I picked it up and I'm not only running with that baton but I'm passing off little batons to as many people as I can," says Bro. Money poured in after Heyer was killed. Bro teamed up with Heyer's co-worker Alfred Wilson to form a nonprofit foundation in Heyer's name. It provides scholarships to students who promise to pursue positive nonviolent social change. Wilson wouldn't say how much the foundation has raised in total so far, but the foundation reported $117,000 in revenue in 2017. So far, the foundation has awarded three scholarships of $1,000 each and five scholarships in conjunction with another foundation. It is accepting applications for next year. "I'm sort of trying to replace Heather," Bro says. Bro's shoulder-length gray hair is pulled back in a bun. Her eyes are bloodshot. She is tired, but in constant motion — taking calls to resolve Heyer's estate, hosting fundraisers, talking to all the reporters who have come to Charlottesville for the anniversary. It's a struggle. "Part of me wishes it was all just a bad dream," Bro says. "That the country wasn't as divided. That black lives really have been treated as if they matter. That Heather was here." She's also dealing with the justice system — attending all the court hearings for the man accused of killing Heyer and injuring dozens of other counterprotesters. A section of the street where it happened has been renamed Heather Heyer Way. "That's a scene of unspeakable horror for so many people who are still living with injuries, who are still struggling to survive," Bro says. "Yes, I lost my child there. A lot of other people lost their lives in a very different way there." She says the blame belongs to "all of us — for allowing the hate to build up in the first place." Now her focus is on stopping hate. "I've had to acknowledge that her death had meaning to the world," says Bro. "I refuse to give her up without making something out of it — not wasting that precious life." The events last year hit a nerve in the community, she says, exposing racial tensions. "The black community and the people of color in Charlottesville have been battling this for many years," says Bro. "But a white girl dies and suddenly everybody goes, 'Oh my God we've got a problem.' 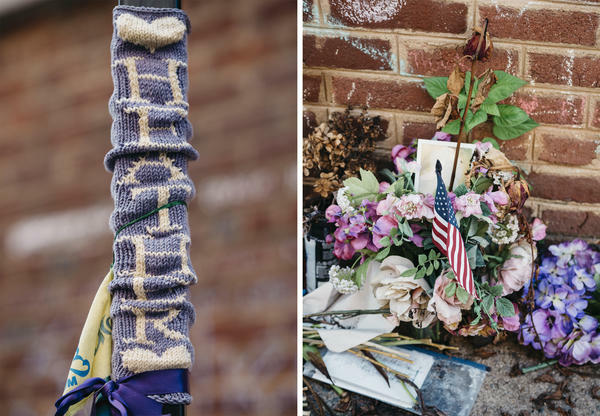 "
Downtown, a makeshift memorial to Heyer remains — people have left flowers, and notes scribbled in chalk on the sidewalk and on brick walls. Bro stops by here often. On a recent visit, there's a dispute across the street between a black woman and a white police officer about her illegally parked car. When the officer leaves, Bro sees that the woman is upset. "Bless her heart," she says. "I want to say something to her." She approaches the driver's window and offers a hug. "You're OK, sweetheart," she says, comforting another even as she bears her own grief. It's an example of how people are on edge with the uncertainty of what might happen this weekend in Charlottesville — memorial events and another "Unite the Right" rally are planned. This Sunday is going to mark one year since a car rammed into counterprotesters during a violent white nationalist rally in Charlottesville, Va. Dozens of people were injured. Heather Heyer was killed. And this is what her mother promised at her funeral. SUSAN BRO: They tried to kill my child to shut her up. Well, guess what. You just magnified her. GREENE: Susan Bro is on a mission now, and NPR's Debbie Elliott has her story. DEBBIE ELLIOTT, BYLINE: The Heather Heyer Foundation is in a cozy office in the law firm where she worked as a paralegal. Susan Bro sits at a desk below a sign with her daughter's favorite motto. BRO: If you're not outraged, you're not paying attention. And I think that's what we have with Heather's legacy is a call to action. ELLIOTT: Portraits of Heather hang on the walls, and there's a collection of posthumous civil rights awards. Bro resists the notion that her daughter is some sort of symbol. She didn't make speeches or lead rallies, Bro says, but tried to convince those around her to care more about inequality and social justice issues. Bro has taken up her cause. BRO: Not only will I speak and speak loudly and often, but I'm going to make sure that other people speak. I have likened that many times to a baton race. So they knocked the baton out of her hand. Well, I picked it up. And I'm not only running with that baton, but I'm passing off little batons to as many people as I can. ELLIOTT: Money poured in after Heather was killed. Bro teamed with Heather's co-worker Alfred Wilson to form a nonprofit foundation in Heather's name. It provides scholarships to students who promise to pursue positive nonviolent social change. BRO: I'm sort of trying to replace Heather. ELLIOTT: Susan Bro's shoulder-length gray hair is pulled back in a bun. Her eyes are bloodshot. She's tired but is in constant motion taking calls to resolve Heather's estate, hosting fundraisers and talking to all the reporters who've come to Charlottesville for the anniversary. It's a struggle. BRO: Part of me wishes it was all just a bad dream, that the country wasn't this divided, that we - that black lives really have been treated as if they matter, that Heather was here. Just sometimes I long for the old life. ELLIOTT: She's also dealing with the justice system, attending all the court hearings for the man accused of killing Heather and injuring dozens of other counterprotesters. The downtown block where it happened has been renamed Heather Heyer Way. BRO: That's a scene of unspeakable horror for so many people who are still living with injuries, who are still struggling to survive. So, yes, I lost my child there. A lot of other people lost their lives in a very different way there. ELLIOTT: Who do you blame? BRO: All of us for allowing the hate to build up in the first place. ELLIOTT: She says the events last year hit a nerve in the community, exposing racial tensions. BRO: The black community and the people of color in Charlottesville have been battling this for many years. But a white girl dies, and suddenly, everybody goes, oh, my God, we've got a problem. And the illusion of Charlottesville was blown apart. And that's been hard for a lot of people to deal with. ELLIOTT: Downtown, a makeshift memorial to Heather remains. BRO: I see even more flowers today than there were yesterday. ELLIOTT: Bro stops by here often as a way to connect with Heather. On yesterday's visit, there's a dispute across the street between a black woman and a white police officer about her illegally parked car. UNIDENTIFIED PERSON: He says, well, I'm going to write you a ticket 'cause you don't want to walk back there. ELLIOTT: When the officer leaves, Bro sees that the woman is upset. BRO: Bless her heart. I want to say something to her. ELLIOTT: She approaches the driver's window. BRO: Can I give you a hug? You're OK. You're OK. We were bearing witness. We were bearing witness. You're OK. You're OK, sweetheart. ELLIOTT: It's an example of how people are on edge with the uncertainty of what might happen during this weekend's memorial events. Debbie Elliott, NPR News, Charlottesville, Va.
(SOUNDBITE OF MAX RICHTER'S "A WOMAN ALONE") Transcript provided by NPR, Copyright NPR.